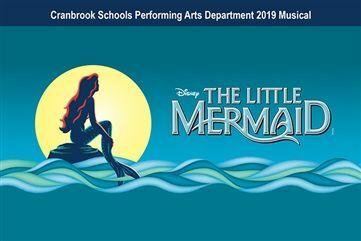 Cranbrook Schools "The Little Mermaid": SOLD OUT! "The Little Mermaid": SOLD OUT! Tickets are SOLD OUT for this week's final performances. Thank you for your support of CK Theatre! Join the "under the sea" for the Upper School Theatre performances of Disney's The Little Mermaid! Please make special note of performance times. We have staggered curtain times to better accommodate families with children. Both Fridays are 7pm and both Saturdays are 5pm. Shows will begin promptly at curtain time and, because of production design and audience limitations, late-comers will need to wait in the lobby and be seated about fifteen minutes into the show. Based on one of Hans Christian Andersen's most beloved stories and the classic animated film, "Disney's The Little Mermaid" is a hauntingly beautiful love story for the ages. With music by eight-time Academy Award winner, Alan Menken, lyrics by Howard Ashman and Glenn Slater and a compelling book by Doug Wright, this fishy fable will capture your heart with its irresistible songs, including "Under the Sea," "Kiss the Girl" and "Part of Your World." Ariel, King Triton's youngest daughter, wishes to pursue the human Prince Eric in the world above, bargaining with the evil sea witch, Ursula, to trade her tail for legs. But the bargain is not what it seems, and Ariel needs the help of her colorful friends, Flounder the fish, Scuttle the seagull and Sebastian the crab to restore order under the sea. Reserve Your Early Admission Tickets Today! A limited number of Early Admission Tickets are once again being offered to the musical. A portion of the Early Admission Ticket price benefits BRAVO, Friends of Cranbrook Schools' Performing Arts. Early Admission Tickets offer entry into the PAC at 6:45 PM for first choice of seats; General Admission tickets will allow entry at 7:10 PM. Box office will open at 6:15 PM in the PAC lobby. Each Early Admission Ticket will allow the holder to reserve ONE seat anywhere in the theatre. One ticket holder may not reserve multiple seats in a row with just one ticket. Each claimed reserved seat must have an Early Admission Ticket placed on the chair in order for the seat to be considered reserved.